From Barcelonnette to south we chose D 908 instead of Col de la Cayolle (this would be actual part of the Route des Grandes Alpes). 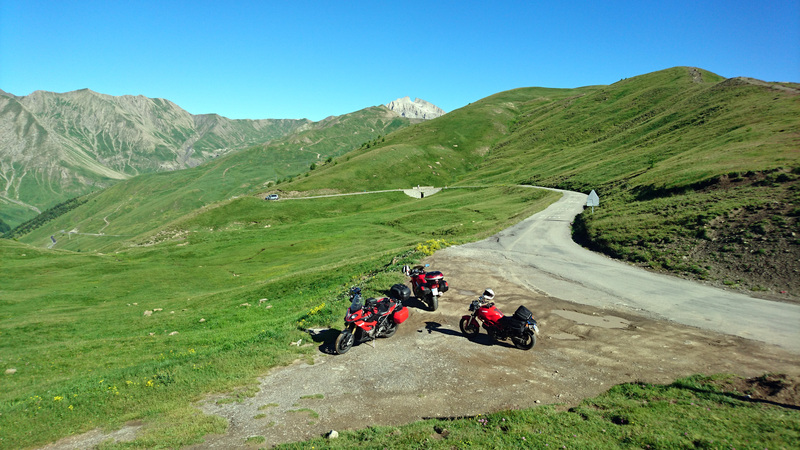 I think it is more interesting to ride Col d’Allos & Col des Champs (like we did)! But before it starts to climb to the mountain Pass you need ride a long time endlessly twisting road following the valley. The river below you goes further and further while you’re climbing higher and higher. Finally I had to stop and check if I can see the river anymore??!! In the top of this beautiful mountain pass we saw absolutely stunning views and I took the best picture of the whole trip here! Wanna see this picture in bigger size? Click here! When riding down from Col d’Allos I had a very scary moment (03:55 in the video)!! A car came from the opposite direction just behind the blind corner… and the road is very narrow and there are no rails! I think my heart stopped for a second!!! But luckily I didn’t have too much speed. The road down from Col des Champs (to east) is wider and easier to ride. Then we rode to Valberg tourist- ans skiresort and from there we rode to Col de la Couillole. From there we were all waiting the final climb for this day -Col de Turini! But before we found the right mountain pass we took the wrong turn!! (Or actually we didn’t make the turn!) After missing the turn the GPS told us to climb to Ilonse… and we did! …So we could finally start the way to Col de Turini. It is simply amazing! There are so many tight corners and hairpins that I think I was feeling a little bit dizzy! And also it felt like it’s climbing a lot! Like at least 2500 meters! But actually the summit of the Turini is “only” 1607 meters high!! But gosh! What an amazing ride!! That red spot is Timo with his Honda VFR! The route for the day 11 was like this! Ride from the magnificent Chalet Sul Lago back to France was much nicer than the day before when we arrived. In France we started riding the endless amount of hairpin corners and mountain passes! First we had Col du Télégraphe then Col du Galibier, Col d’Izoard and finally Col de Vars. This climb ends in Valloire village and from the southside of Valloire starts the climb to Col du Galibier which is one of my favorites! It has a short tunnel on the top, but to reach even higher you have to take the alternative route and finally reach the 2645 meters. Col d’Izoard is more south and it starts from Cervières village (If you ride from north to south). The view on the summit is a little bit different than in many other mountain pass, the mountain walls are mostly gravel and stones! It is a barren sight! Col d’Izoard is 2360 meters high! Finally we had Col de Vars (2109m) where we had some ice cream! We had the accommodation in the middle of Barcelonnette city. Here’s the route for the day 10. This was the day when we finally entered the Alps and the route that I planned this whole trip (Route des Grandes Alpes). But before we actually got to ride the endless hairpin corners… we visited the Les Gorges du Pont du Diable. This is a place where the river has been “digging” the limestone for millions of years. It’s not a cave but almost… The hole is 40 meters deep. It costs 6,10€ to take a 40 minutes tour with a guide and it really is worth every penny!! It is amazing place! And it’s only 20 minutes from Thonon Les Bains. Then the first climb we took was Col de la Colombiere which is 1614 meters high mountain pass near Cluses. Then we climbed Col des Aravis, it’s still not very high but it offers one of the best views to Mt. Blanc! You can see the highest mountain in Europe from many places if you’re driving south of Col des Aravis. Then we had Cormet de Roselend, which is almost 2000 meters (1968 meters), this offered already very spectacular views from the top!! Especially the Lake Roselend with the clear turquoise water is really worth to make a break and admire the view! And finally we had the highest mountain pass in Europe in the afternoon: Col d’Iseran (2764 meters). The summit is still a lonely place! There’s no restaurant or no souvenir-shop just an old chapel made of stone… and I think they don’t even use that anymore! There’s still old meters in the sign… It has been checked few years ago that the real hight is few meters lower! When we rode down to Val d’Isere it started to get cloudy. We had one more climb to make since we had our accommodation in Italy (Moncenisio). We did see a little bit of of the Lake Mt Cenis, but after we crossed the border we had no visibility anymore! We’re riding in the clouds! And the road to the amazing Chalet Sul Lago was extremely narrow with the branches of the trees coming very low… it felt like a scene from a horror movie!! And finally when we found the place… it had a very pleasant surprise for us! No, it is not a Michelin restaurant with any stars… But it is mentioned in the Michelin quite many times (as you can see!) -And yes the food was good! Here is the route for the day 9.